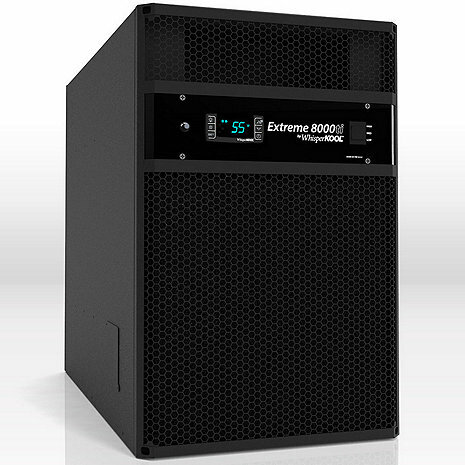 The Extreme Platinum Series is WhisperKOOL's most advanced and powerful self-contained cooling unit. The Extreme is designed to fit between standard wall studs for simple "through-the-wall" installation with minimum modification to existing wall structures. Extremes are acceptable for mounting through an exterior wall and can operate in a 110°F exhaust environment. The Platinum Series includes our most advanced LED liquid temperature controller and upgraded electronic components. The systems are designed to maintain 55°F and 50-70% relative humidity in cellars up to 2,000 cubic feet. Made in the USA. Mounts easily through your wine cellar wall and vents to an adjacent room or outside. Venting space must be as big or larger than you wine cellar. Your cellar must be properly insulated and vapor sealed for the unit to cool properly. Can this unit be installed in/on an exterior wall with venting to the outside? Yes, the Extreme series is made for that specific purpose. Can this unit be installed on its side or does the cooling unit have to be long side up and down? This unit cannot be installed on its side. Please give one of our storage consultants a call @ 1-800-356-8466 so they can answer all questions you may have. I had a WK6000 that had been installed on the outside of my home, after the first year or two during the summer it seemed to struggle to keep my cellar at 57 degrees. One day I walked through the cellar door I noticed that the temp was warm. I saw ice covering the front of the cooler. I had the service guy out, he couldn't fix it here so he took it back to the shop, He called later and said I had two choices, pay $800 or so to repair it or get a new unit. Since it had been years since I even looked at the back of it let alone vacuum it he said it was packed with dirt, a fan was out and there was a leak and the refrigerant was low. The neglect and hot summers took a toll on the cooler. I decided that replacing it made more sense, I could get the same cooler but with all things considered I opted for the 8000ti. It fit in the same opening as the 6000 so I didn't need to modify the opening. It can be over 100 or freezing, the cooler comes on when it needs to so that my wine stays at 57 degrees. Yes, it did cost much more than the 6000 but considering the investment that I have in my cellar why should I take a chance with a unit that was not designed for my cellar. I just built-out my English basement (finished Oct. 2017), which has no stairs, is flush with the rear driveway, and has ~1500 sq. ft. of space. Following guidelines by experts, including thorough insulation, entrance-sealing and vapor barrier installation, I included a large wine cellar/wine tasting room with capacity for >1100 bottles. Since the space is ~1700 cu.ft., I chose a cooling unit with 2000 cu.ft. capacity. This unit works very efficiently. Initially, it cooled the room and the wine bottles down from 72 to 55 degree F in just 5 hours. It's easy to program and operate and has worked quietly and flawlessly since it was put into use. Installation was somewhat difficult, however, including the rear ductwork through the house's side wall. (The front of the unit protrudes through the wall of one high corner of the wine room.) Also it appears that routine maintenance may be tedious, including regular filter cleaning, condensate line purging, and addition of anti-bacterial pellets to the condensate system. Overall, though, I'm highly satisfied with this purchase and look forward to many years of largely trouble free operation of the unit.